Did you know that the average age of American skilled workers is nearly 55 years old? As more and more trained, experienced and highly-skilled workers retire, the gap in the skilled labor pipeline will continue to grow. This expanding divide is already threatening dozens of trades, and the floorcovering and carpentry industries are no different. The skilled labor shortage has a potentially devastating consequence for our economy as well. At the height of the recession, more than 30% of American manufacturers reported that they had jobs going unfilled because they could not find workers who have the right skills. This trend is once again rearing its ugly head, with the Bureau of Labor Statistics reporting that job openings in the United States topped 7 million for the first time ever in August 2018. Open positions outnumbered unemployed Americans by nearly one million units. This isn’t a uniquely American problem either. A record 47% of small Canadian businesses report that they are experiencing of shortage of skilled labor, according to a 2018 survey conducted by the Canadian Federation of Independent Business. The shortage of apprentices and skilled-trade workers has exposed the lack of training programs and opportunities for students who are seeking a vocational education. After decades of high schools closing down career and technical education programs, there is a disconnect between trades and students. Additionally, most American states and Canadian provinces lack any kind of centralized, easy-to-navigate system for actually breaking into the trades. This makes it difficult for young men and women to learn about apprenticeship opportunities unless they already have an existing connection within the industry. So how exactly does the floorcovering industry, including INSTALL, contractors and construction companies, attract new blood in this complex and competitive environment? Reviving the skilled training pipeline isn’t going to be easy, but it is possible if we work together to implement promising new programs and initiatives. One way the floorcovering industry is attacking the problem is through outreach and partnerships. “We’ve started to place added focus on open houses and opening up training classes to new audiences,” explained Doug Wilkinson, council representative and INSTALL director for the Central South Carpenters Regional Council. The Career Connections program is designed to help high school teachers introduce students to a career in any of the carpentry crafts. Students learn basic and intermediate carpentry, advanced skills in commercial and residential construction, and the essentials of construction site safety. The program also includes training in the employability that research shows employers value most, including goal setting, positive attitude, punctuality, teamwork, and taking initiative. Program materials have been written by carpenters from around North America who have both teaching and field experience. Procedures for the projects are designed to be completed using typical school shop tools and have been built and tested in UBC training centers. Teacher support is a major feature of the program. All books come with an annotated edition that provides teacher class notes, rubrics for each project, project evaluations, a tool safety operation checklist, a comprehensive skills matrix, and estimated timelines for teaching. Teachers and students can see projects built step-by-step using the program’s Virtual Shop software. In addition, trained and certified outreach specialists—all experienced carpenters—support teachers through mentoring while also ensuring safe shop practices. Tours of INSTALL training centers and professional speakers such as contractors or manufacturers are also made available. While Career Connections continues its roll-out in Oklahoma and states like Texas, Arkansas, Louisiana and Mississippi, other regions of the country are struggling with unique problems with equally unique opportunities. “There are two areas where we are working to address challenges in the New York City market,” explained Paul Capurso, lead regional manager of the NYC District Council of Carpenters. “One is floorcovering and the other is general carpentry.” Capurso has found that there is no shortage of students who discovered that college wasn’t for them. Unions remain strong in this part of the country and word-of-mouth and family businesses have helped create generation after generation of floorcovering installers. 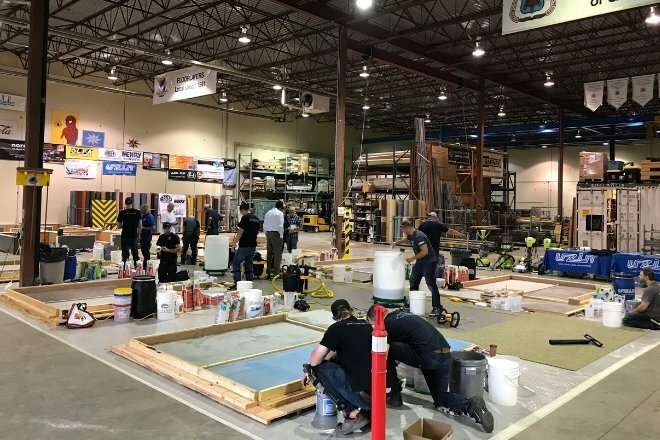 However, while these young professionals and would-be apprentices are applying to programs within the Carpenters Union, they are not specifying floorcovering. Additionally, many floorcovering contractors in the New York City metropolitan area are run by second or even third generation owners. This is helping to create passionate, competitive and highly-trusted brands. However, these companies are still challenged by low-cost, non-INSTALL independent shops. “Even though INSTALL Warranty Contractors have up to three generations of owners, their upfront costs can be higher than the competitors,” explained Capurso. “However, when you look at the total value of the service, including the industry exclusive warranty and expert installation from highly trained professionals, the investment is well worth it,” he added. Capurso recently developed a Market Recovery Addendum which sets new, competitive rates for different tiers of carpenters across the board (from foundation to interior system to flooring) that helps contractors be more competitive with costs. They are also working closely with developers to make sure they have the right contractors bidding for the right jobs. All of this works to create a more stable and attractive working environment for apprentices, leading to happier employees, higher retention rates and stronger word of mouth. This helps to increase the profile of the floorcovering trade and boosts interest from students and professionals in other trades and industries. Despite continued challenges in the skilled labor market, there is a silver lining in recent news. Many floorcovering installers have pushed back plans for retirement as the economy continues to fire on all cylinders. They are able to find constant work, helping them boost their retirement portfolios and add some cash in their pockets before they say goodbye to the industry. *This article originally appeared in the January edition of Floor Trends Magazine.